Nothing is quite as nice as the sound of the waves crashing on the seashore and the feeling of sand between your toes. 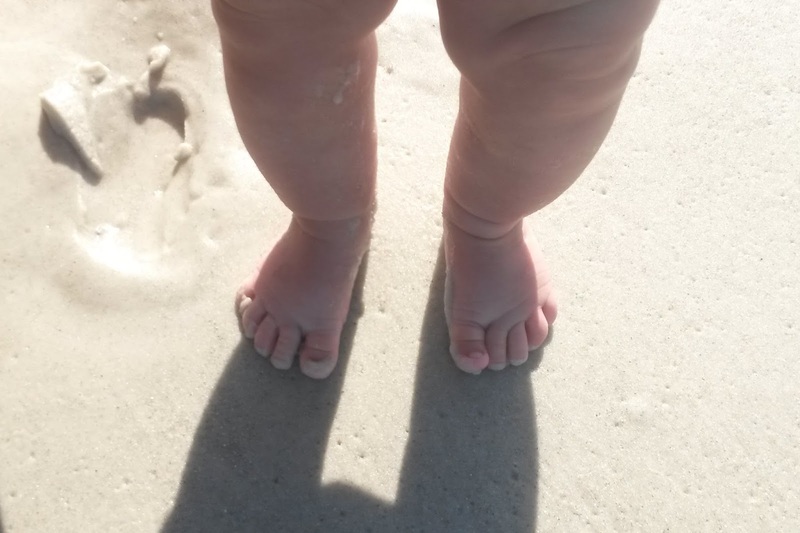 Bringing baby to the beach may take a lot of preparation but following these few tips will ensure a more enjoyable time for everyone. Babies under 6 months old cannot wear sunscreen and should thus be kept out of the sun and in the shade. 6 months and older can wear baby safe sunscreens. Make sure to apply the sunscreen to all visible skin before going outside, and reapply often. Also, try to avoid direct sun exposure when the sun is the strongest. A sun hat and sunglasses will help protect baby's face and eyes from the sun. A UV suit will provide protection for baby's sensitive skin. There are a few different brands of swim diapers available, which are excellent to use if you plan on getting in the water. If baby is walking, water shoes will be good to protect her feet from the heat of the sand or any sharp shells or rocks. A beach tent is good for keeping baby in the shade and provides a nice place for baby to lie down for a nap, as long as it doesn't get too hot in there. A baby carrier is a good idea for taking walks along the seaside. There are even water safe carriers that are great for taking baby into the ocean. Bring along toys to keep baby entertained. If baby is formula fed, bottle fed or eating solids, bring along their food for the day. A dry change of clothes will let baby be comfortable for the ride home. And don't forget to bring the sunscreen to reapply later! Try to keep babies from getting too much sun exposure. Always supervise babies and kids of all ages closely. Make sure baby doesn't get too hot or too cold. When getting in the water, stay in the shallows and always keep a hold of your baby. Avoid the water if the waves are too rough that day. Be mindful of rip tides, which could drag even the strongest swimmers out to sea. If caught in a riptide, swim parallel to shore and gradually inward. If stingrays may be present, always shuffle your feet, don't take steps. Do try to keep your baby from putting sand, shells or seawater in her mouth, but don't panic if she does. Just rinse out her mouth and be aware that she may experience an upset stomach later.